It was the longest night I ever had. When I woke up at around 1AM I did not fall asleep for some reason. 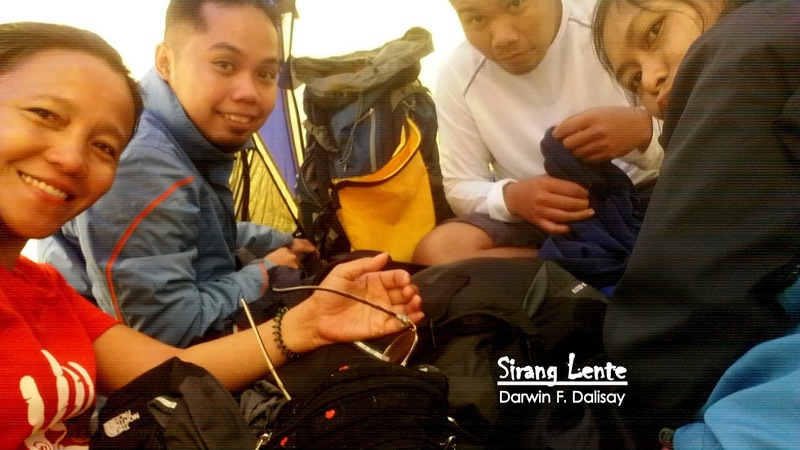 The wind was strong and as it penetrates inside the tent and hits my skin, it was like a knife that cuts and makes a wound because of its temperature and we were also bothered by the bad weather that might affect our ascend to the summit. After preparing our food, we started preparing for assault. Wore three layers of clothes, consist of cotton shirt, sweater then water proof jacket on the outer side. That moment, we were hesitant if we are going to hike or not because of the unfriendly weather condition. Finally, the long wait is over, the sun light just showed up and started penetrating our tent's cover but still the temperature and the wind's gustiness seemed to be the same. Alfie and Ato, together with the guide and porters started preparing our breakfast and packed lunch. Before we started trekking to the summit, we made sure that everything is prepared. Photo above was taken before leaving the campsite to the summits of Mount Apo. Thick fog and the sun was still hiding from us. Being on top and stepping on the summit of Mount Apo seemed to be the end of my career in mountaineering. I didn't know what was the reason why I am thinking of such idea,but one thing for sure, it was not be the end. 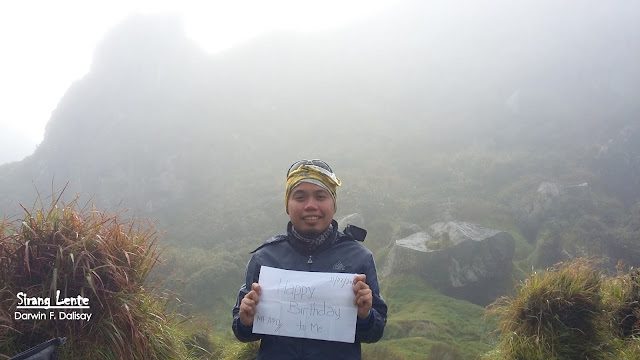 One of the summits of Mount Apo, with a thick fog on the background. After reaching all the seven summits of Mount Apo, we headed back to the camp site and broke camp. Photo above is a proof that the background was still covered with thick fog and the sun was still playing hide and seek. Strong wind with cold rain showers were the greatest challenge that day and it was also my birthday! We left the camp site at around 9:30 AM with our camera and cellphone batteries started draining because of the low temperature, making me to focus on the beauty of nature, instead of taking photos on the trail. While walking, I saw that the terrain of Mount Apo is still considered as virgin. The trails were still covered with shrubs and grasses, the mosses and orchids hanging on the trees were like perfect ornaments. We arrived at Lake Venado at around 12:10 PM and had our lunch break by the lake. Venado has a cool and crystal clear water, surrounded by trees and the ground is covered with grass. We stayed at this area for an hour and started descent. From Lake Venado to the village, I observed that the terrain can be characterized as untouched forest and everywhere is green and the flower blossoms on the sides give an amazing view. Then, the next part was a challenging one, the terrain is wet, making the trail so sticky and slippery and hard to penetrate. When we already reached the jump off, the tangke area, and where our habal-habal drivers were waiting for us, we immediately put our backpacks on the ground and took an hour rest, while eating peanuts. It was already late in the evening and we didn't have any food yet, so our knees were shaking but with a smile on our faces. When done with the rest, we rode on the habal-habal passing on the death defying road to the market. Tidy up and had our formal dinner then proceeded to Davao City for our next destination - Island Garden of Samal. Ooops. I am wrong! 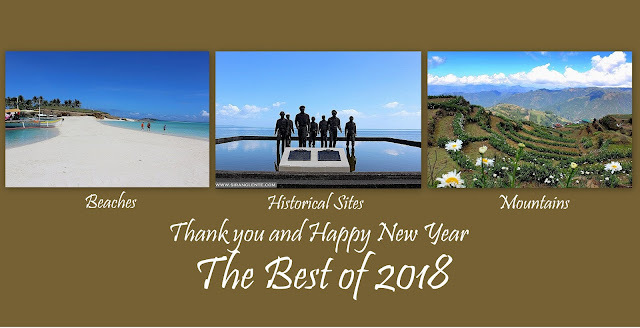 We had an over night stay at the hotel in the city and then Samal Island the next day. Photo above was taken at the gorgeous beach of Talicud Island. Talicud Island is a smaller island situated at the back side of Island Garden of Samal or literally ‘sa likod.’ This is one of the island paradise in Davao del Norte that bears fine beaches with crystal clear water, fine white sand, colorful underwater creatures and hospitality from the locals. More photos, click here.